I learned how to make these on a video tutorial by Cakincrazy on Youtube. Unfortunately, they have removed the video already. 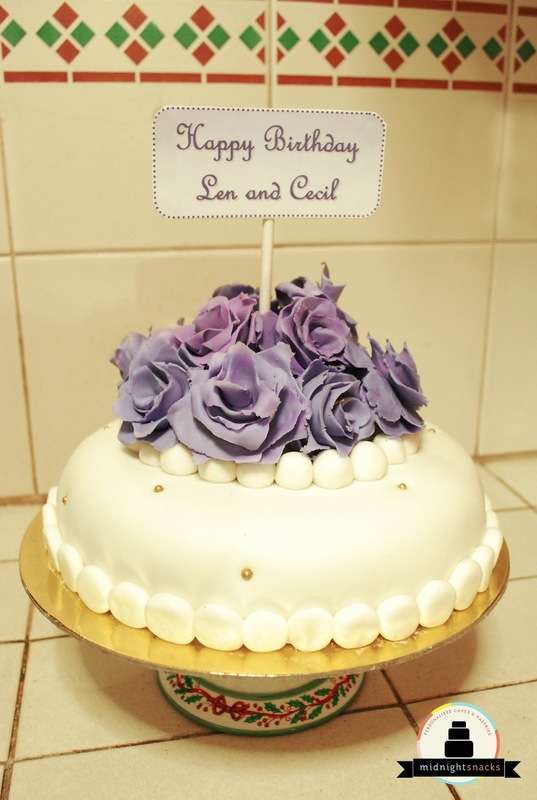 Tip: For gold-colored flowers or anything that you'll be painting gold, start off with an ivory colored fondant. It will be a lot easier to paint them. I used Americolor Ivory gel paste coloring. Step 1: Make sure that you have a soft/moldable fondant (I use homemade marshmallow fondant). If it hardens/tough to knead.. place it in the microwave for a few seconds depending on the size. The smaller it is, the fewer seconds it needs. This will also depend on your microwave. Step 2: Cut a piece and roll it up to the size/thickness of a thin person’s finger. Around 1-1.5 cm in diameter, I guess.. This will depend on how big or small you want these to be. Step 3: With a rolling pin, roll it to make it longer not wider/ roll it vertically? Does that make sense? Well, you can just see it from there. Step 4: With a small offset spatula (for bigger flowers) or a fondant decorating tool (the greenish blue one right there) seen in the photo for smaller flowers, pull the fondant outward to make frills that will act as mini petals. Leave a tiny space in between one after the other. Step 5: Paint the petals with a Gold Sheen Airbrush coloring (Americolor Brand) using a nylon paintbrush. Do not use an airbrush for this because you will surely waste a lot of it and probably spray more than it can hold and won’t be able to dry fast. Also, it will be very messy to roll into a flower. Step 6: Roll into a flower! Tadaaaaa!!! Step 7: Let it dry and harden. Tip: Let it harden overnight (a few nights will also do) in an air conditioned room. Do not open the windows in the morning once you have turned off the AC.. Just let the temperature get warmer by itself. Once it is in room temp (about 30 minutes to be sure), take it out and repaint it with the Gold sheen again. In cold/rainy weather there is a lot of moisture in the air that will surely soften/moisten your fondant. For best results, Once you have made these flowers, keep them in a closed room in the morning and in an airconditioned room during the night. This can also be done with the finished cake/cupcakes. In hot weather, fondant tends to dry, harden and become brittle easily. No problem with the drying/hardening stage. It is just a pain when it comes to the molding/sculpting process. Being quick saves you from a lot of microwaving. With marshmallow fondant cakes, this is actually the best weather for it. No need to worry about the storage. The fondant acts as a protective layer to the cake. It will keep it moist and still at best quality even up to 4 days. Since majority of it is made out of sugar, harmful bacteria cannot grow in it.